Property was very clean and ammenities were great. The property location is great for a winter snowmobiling trip. Easy access to trails and backcountry. Owners are great to book with and very accommodating. Home is very clean. A beautifully situated and well equipped section of a larger house. Loved the lakeside sitting area and unique visitors book! A quiet and peaceful setting very close to Gros Mourne in the lovely Newfoundland, well worth the long trek from the UK. Wish we could have stayed longer. Thank you Andrea. Where to find Bonne Bay hotels near an airport? Where can I find hotels in Bonne Bay that are near tourist attractions? Considering there's just 1 Expedia-listed lodging option within a 0.1-kilometre (0.06-mile) radius of Bonne Bay's downtown, it makes good sense booking a room early. The Gros Morne Suites, Newfoundland and Labrador, which is the nearest accommodation, lies 11 kilometres (7 miles) from downtown Bonne Bay. 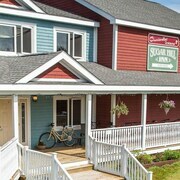 As an alternative, you could check out the Sugar Hill Inn, located in Newfoundland and Labrador, which is 6 kilometres (4 miles) away. Looking to travel a bit further afield? Newfoundland has a number of attractions. Photographers will appreciate Newfoundland's rivers, streams, lakes and mountains. You should also explore a selection of its old towns, cathedrals and art museums. Common activities in this particular part of Canada include snowboarding and skiing. The closest places to stay in Newfoundland include Steady Brook and Corner Brook. Steady Brook is 60 kilometres (37 miles) to the south of Bonne Bay, while Corner Brook is 60 kilometres (38 miles) to the south. 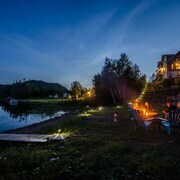 Steady Brook hotels are the Marble Villa at Marble Mountain Resort and Marble Inn Resort. While accommodation options are the Glynmill Inn and Comfort Inn. Before you say goodbye to Newfoundland, why not make sure you experience some local sport. Visit My Newfoundland Adventures to the south of Bonne Bay. 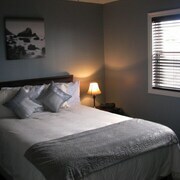 Sleep close to the action at the Grenfell Campus Summer Accommodations or the Greenwood Inn & Suites. Deer Lake Regional Airport is a convenient airport, and is 50 kilometres (31 miles) away from Bonne Bay. Nearby accommodation options are Holiday Inn Express Deer Lake and Deer Lake Motel. 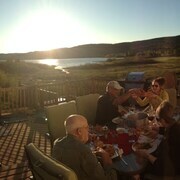 Are there hotels in other cities near Bonne Bay? 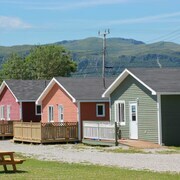 What other types of accommodations are available in Bonne Bay? Explore Bonne Bay with Expedia.ca’s Travel Guides to find the best flights, cars, holiday packages and more!